Traffic congestion builds around what has been billed as “the world’s most confusing traffic lights” at the Yangrenjie Theme Park in Chongqing. The lights, which are actually an art installation, confused drivers entering the park and have since been removed by park officials. By Naureen Kabir, director of the Urban (co)LAB at the New Cities Foundation, and Casey Weston, researcher at the Urban (co)LAB. This article was first published by chinadialogue. The extraordinary growth of China’s cities is well-known. Today, 160 Chinese metropolises have over one million inhabitants and more than half the population lives in urban areas, which are growing at two to three times the rate of Western cities. One sector feeling the weight of this unprecedented demographic shift is transport. In a country where the number of cars grows by more than 10 percent each year, urban planners and transport authorities need innovative techniques to address road congestion. A recent study by the New Cities Foundation has particularly interesting implications for urban China. Working with technology company Ericsson and the University of California, Berkeley, we used smartphone apps to connect travelers who take the same daily route to and from work, allowing them to share relevant, useful information with each other. The report, based on a year-long pilot project in San Jose, California, presents an opportunity for transport agencies, local governments, and mobile phone app developers around the world to identify new ways to improve the commuter experience. It examined the effects of tools like Waze and Roadify, two innovative smartphone apps that allow drivers and public transit users respectively to share information in real time. Such apps are based on a passive contribution model—simply by driving with the app open on your phone, you passively contribute traffic and other road data that helps the system provide other commuters with the optimal route to their destination. There are opportunities to supplement this information with more detailed traffic reports, and it is the responsibility of the commuter not to put others at risk and drive responsibly, by entering traffic information while the car is stopped during a traffic jam, for example. The benefits extend to both individual commuters and organizations working on transportation and mobility. We found that commuters’ ability to receive or share real-time information with other travelers effectively reduced commute-related stress and provided a sense of community. Moreover, car drivers connected to other commuters via social apps tended to be happier with their commutes than unconnected drivers. This was because of the timely information they received and the information they shared with others, which gave them a sense of satisfaction at helping fellow commuters. There are cultural, demographic, and technological reasons why these insights have the potential to improve urban mobility in China. Second, like commuters in San Jose, Chinese commuters tend to drive alone. As the data analysis of connected commuters in California indicated, drivers valued the ability to share their feelings—and useful information—with fellow commuters. Similarly, the staggering number of lone commuters flooding China’s roads each day could benefit from a more enjoyable drive to work enabled by these mobile apps. Finally, at the city level, connected commuting could provide millions of Chinese people with the necessary information to make better commuting choices, with positive environmental, social, and economic ramifications. 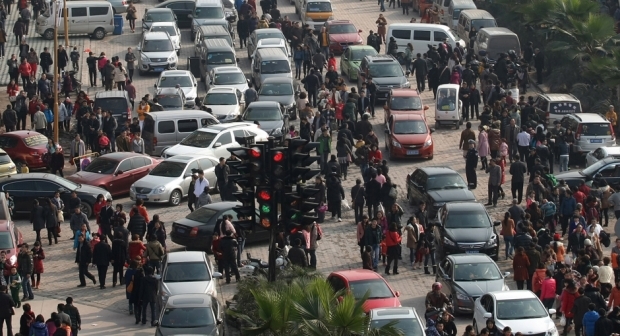 In fast-growing Chinese cities like Wuhan and Shenzhen, the rapid rise in car ownership makes it difficult to assess how traffic patterns will change in the future. The need to evaluate and react to a fluctuating situation has already elicited a variety of responses from local authorities. Wuhan, for example, has installed traffic lights that react to the flow of traffic to minimize the disruption typically caused by intersections. Similarly, data gathered from smartphone apps could provide more clarity on pain points for drivers—by location, time of day, or day of week, for instance. The authorities could then use this information to develop commuter programs, adjust regulations to optimize traffic, or incentivize commuters to avoid overloaded junctions. As Chinese cities and infrastructure investments grow, the mix of qualitative and quantitative data generated by apps like Waze or Roadify could help authorities address areas that consistently cause stress for commuters and are a source of pollution.